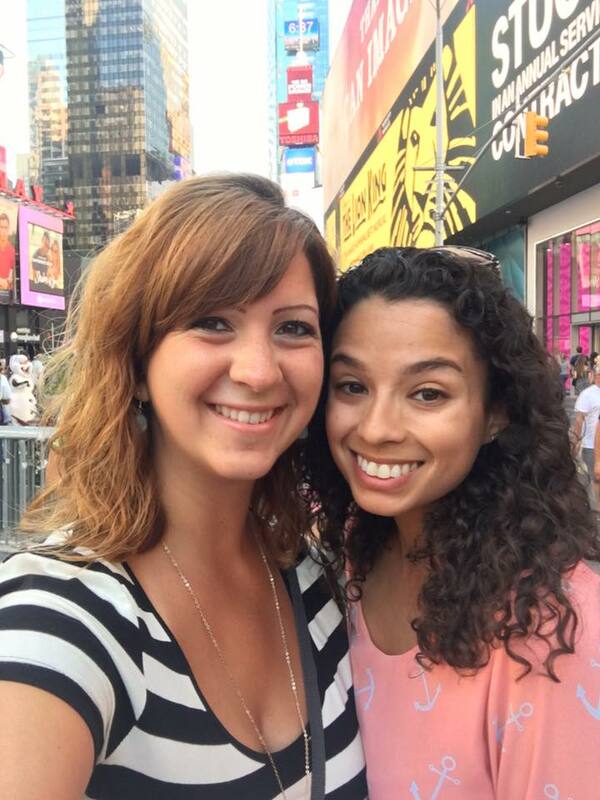 Last weekend, Holly and I met up in New York for the weekend. Holly and I have been talking about taking a trip to a ballpark for almost a year now. Originally, we were going to head to Minneapolis for a weekend to visit a ballpark neither of us had been to, but after some thinking, I thought...I should take her to MY stadium! Almost as soon as Major League Baseball released their 2016 season schedule, Holly and I made plans to head to New York to catch a Mets game! I flew to Philly on Wednesday night and took the train into New Jersey. My mom and I spent Thursday working from home together and then we had dinner with my nieces and cake at my aunt's for her birthday. I hadn't been home since Christmas and it was so good to see my family! Friday morning, I hopped on a train in to New York and met Holly at Penn Station shortly after her flight landed. We couldn't check into our hotel right away but we dropped our stuff off, grabbed some lunch and walked over to Central Park to eat and catch up. Once we got settled into our hotel, we went back to Central Park to wander around the South side of the park and then made our way into Queens to meet up with one of Holly's friends at a beer garden. Once we left the beer garden, we made our way to CitiField. I organized a group of my closest friends who are Mets fans (and Carolann! ), most of whom Holly met at our wedding and hit it off with, and we had a blast! 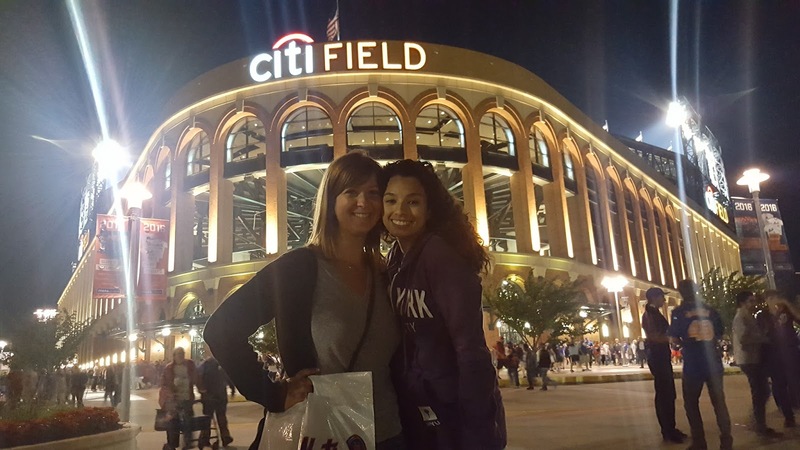 The Mets lost...BOO...but Holly loved CitiField and I loved showing her around the Mets stadium! After the game, I took Holly down to my old neighborhood to pay a visit to Artichoke, the best place in New York for a late night snack. It's basically a slice of pizza slathered in butter and drenched in spinach and artichoke sauce. It's heavenly and amazing and it was just as good as I remembered it! Saturday morning, Holly and I made our way to Central Park for a run. I was fighting a miserable cold and Holly was fighting a lingering cough from a miserable cold she had had a week before, so we weren't in great shape, but I told Holly that I was determined for both of us to run a full loop of the park and that we would take walking breaks so that we could both make it, and make it we did! There are only two things I miss about living in New York. 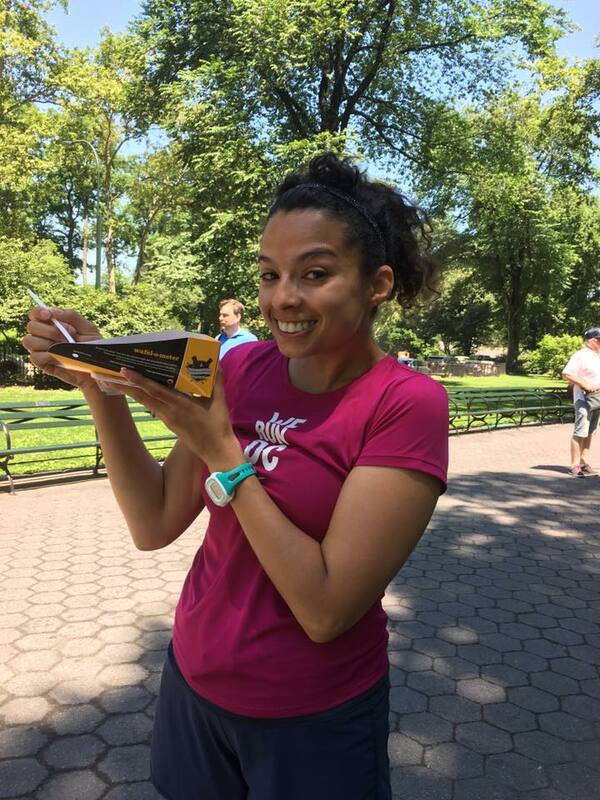 Running in Central Park and Wafels and Dinges. Lucky for me, there's a waffle truck in Central Park now so as soon as we finished our run, we headed to the waffle truck for some delicious Belgian waffles slathered in cookie butter and topped with strawberries. We sat on a park bench listening to a sweet old man playing La Vie en Rose on some sort of instrument and it was the perfect end to our run. We headed back to our hotel to freshen up and then made our way to Madison Square Park so that Holly could try Shake Shack for the first time. We both had the Shroom Burger (the only kind of burger I've ever eaten at Shake Shack) and then wandered around the West Village looking for ice cream. After satisfying our fix, we headed back to the hotel to change and then made our way to Times Square to meet up with my mom to see Shuffle Along on Broadway. The show was wonderful! Tap dancing, fun costumes, great singing...I loved it! The second half fell a little flat for me, but I definitely recommend this show. I absolutely adore tap dancing shows...some of my all-time favorites are Crazy For You, Thoroughly Modern Millie, and Anything Goes, and this one didn't disappoint! They say tap dancing is a dying art, and I sincerely hope that isn't true! Sunday was our last day in New York, but we had most of the afternoon to enjoy ourselves. We made our way downtown to the Brooklyn Bridge and walked a little ways onto the bridge before making our way across City Hall Park to the World Trade Center. When I was in grad school, my classes were held in the Woolworth Building across from the WTC. 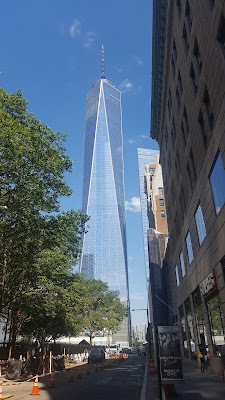 I graduated in 2012 and hadn't been back since, so the last time I was there, One World Trade was still an enormous construction site. It was really nice to see how much the area has changed and how beautiful the memorials are. Holly and I spent some time reflecting and then slowly made our way back to our hotel to check out, grab a bite to eat, and be on our separate ways. Holly and I had a blast and I'm so glad we were finally able to make this weekend happen! I loved showing Holly all around New York, especially as she crossed my team's stadium off her list! At the same time, it was so weird to be back. I hated living in New York and being back, I realized that I didn't miss it one bit. When I got to the airport to make my way home, I was so happy to be hopping on a plane back to DC, which is so much more my city than New York ever was. I'm having terrible luck with books this year. Aside from being terribly behind on my Goodreads Challenge, I really haven't read anything that I've actually liked this year. 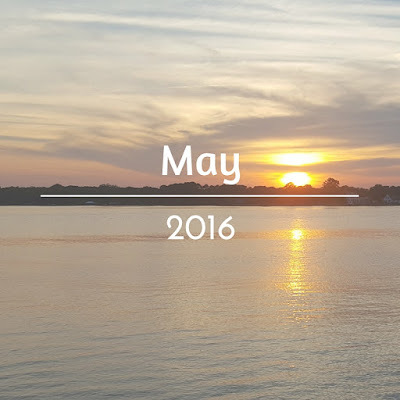 At the end of last month, I set the ambitious goal to read 8 books in June. With 5 days left in the month, I know I won't hit that, but I'm hoping I'll have hit 6. 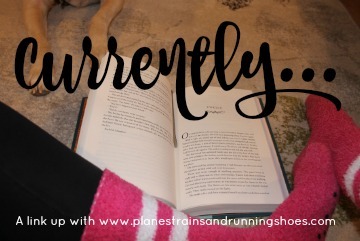 Carolann and I are hosting our monthly "Beyond Bloggers" book club this week, so here's a look at what I have been reading. My sister is in a creative writing class with Rita Gardner and brought me a signed copy of her memoir, telling of her childhood growing up in the Dominican Republic. My mom is from the DR so I was intrigued to read this. It was ok. The entire book was told in the present tense, which made it really difficult to assess the passage of time. I was shocked to find at one point, that the author was starting high school, when it seemed like only a few pages before, she was still a child. There was a great deal of mystery and tragedy surrounding an event with her sister, which was never fully explained. In the Afterword, there's a note about her never having really learned what actually happened, but it was such a focus of the book that to never fully understand what happened leaves the book seeming unfinished. I read this in a day and loved it. It's an easy read and I think it leaves plenty of room for creative interpretation with the film coming out later this year. My favorite part of this book is the history behind how the wizarding community has allowed muggles to believe that beasts like unicorns, mermaids, and dragons are fictional, and the measure they have taken to protect those creatures and let us mere muggles keep believing that! This was the book that was selected for our bloggers' book club this month. I hated this book...absolutely despised it. I gave it 1 star on Goodreads. The entire book was written in the present tense, which became really annoying after awhile. By the end of the book, you still had no idea how long he had been stalking her for. There was no character development, you didn't learn anything about Joe, or anything about Beck, really, other than what he learned from stalking her (which was a lot, but that isn't character development). The book was exceptionally vulgar and I didn't find it "captivating" or "engaging" at all. I've been saying for years that I want to reread the Harry Potter series. I haven't read all of the books since The Deathly Hallows came out nine years ago. The Pilot bought me this copy for my birthday and I loved rereading the story. The illustrations were stunning! So, there you have it. That's what I've been reading this month. I'm in desperate need of good books to read! What's good that you've read lately? Looking for a summer book club to join? 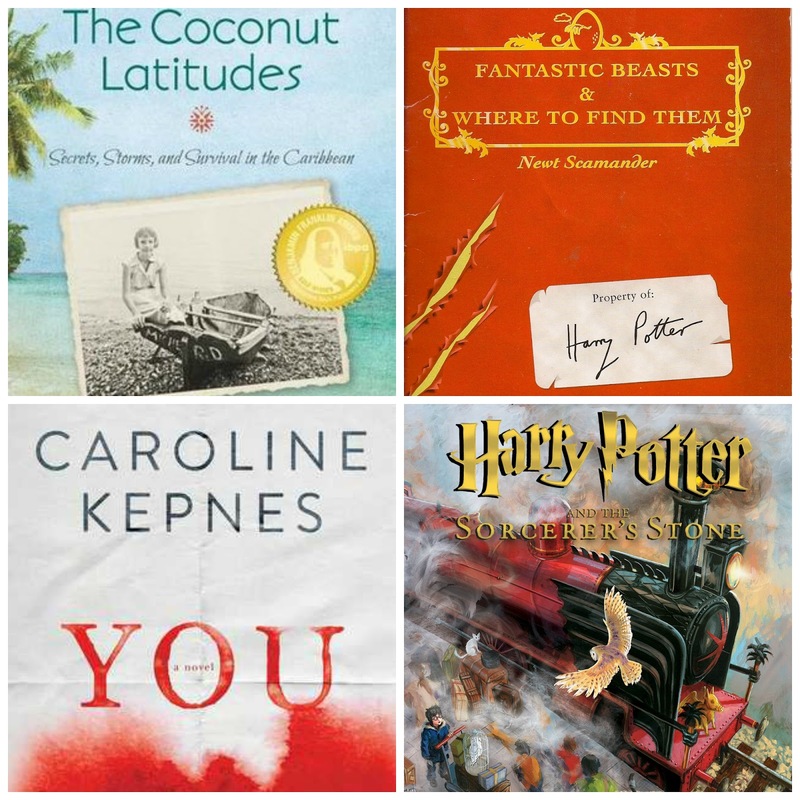 The poll for our July book club is on our Goodreads page! Hello! I hope everyone had a fabulous weekend! 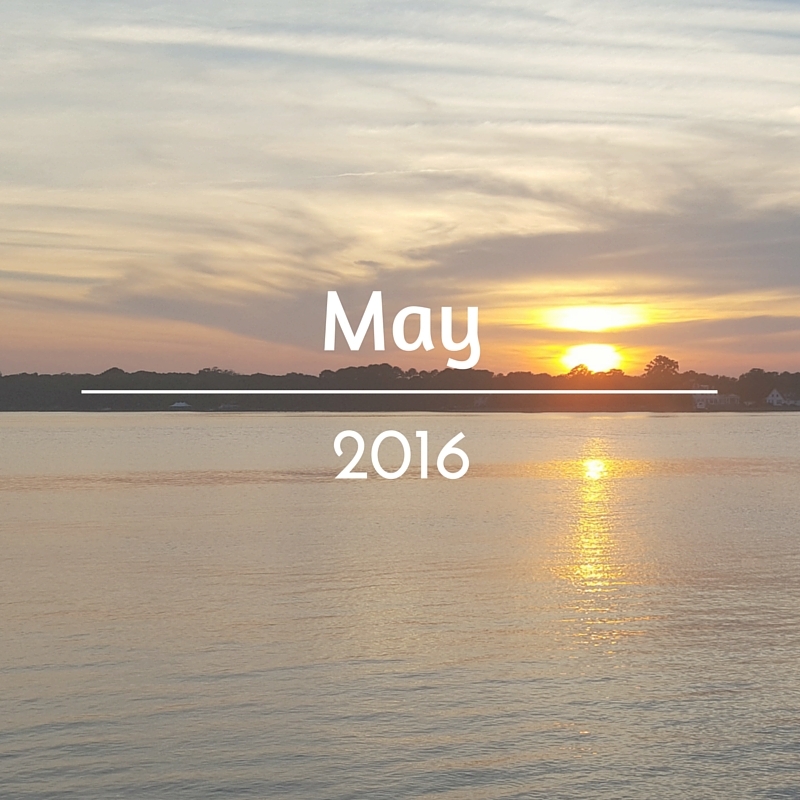 I didn't manage to get more than one post up last week (oops) but it's actually for good reason! Instead of being inundated with work (I mean, I was but I'm finally starting to balance work and life a lot better! ), I've been taking time for myself, spending a lot of time outside and with friends. I've also kicked off what I can already tell will be an amazing summer, so let's back up to last weekend and I'll fill you in! My little sister, Sammi flew in from Dallas late last Thursday night and we had an amazing weekend! She had only been to DC for our wedding so I took the weekend to show her all over the city! Our first stop on Friday morning was a trip to Ted's Bulletin for breakfast and their homemade pop tarts! 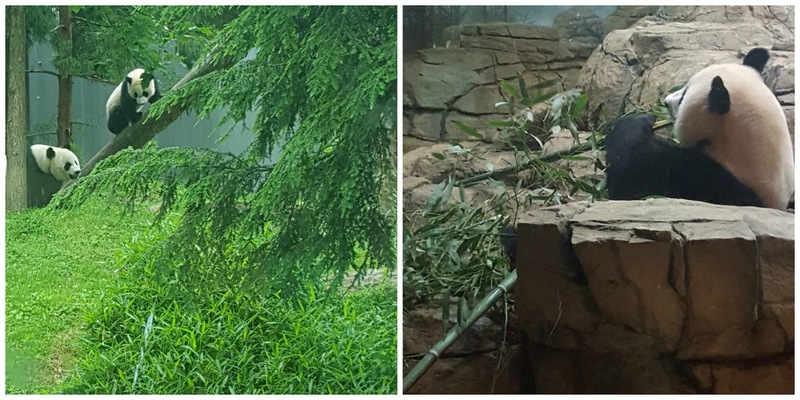 Next, we went to the National Zoo to pay a visit to Bei Bei, the baby panda born last year! Oh my goodness! Bei Bei and his mom were out playing and we watched them for almost an hour! It was so sweet! I love the National Zoo because the animals are always so active! While we were at the zoo, it started pouring! We hopped on the metro and made our way to the Mall to stop at the Natural History Museum. They have a new exhibit with National Geographic on photographs of nature and it was incredible! We left the museum and headed home to walk Peyton before making our way back to Eastern Market for Happy hour at Ambar. Ambar is easily my favorite restaurant in DC. They have an incredible brunch, amazing Happy Hour, and Balkan food that makes me feel like I'm in Bosnia again. We ate to our heart's content before making our way to the H Street Country Club for some fun and then called it a night. 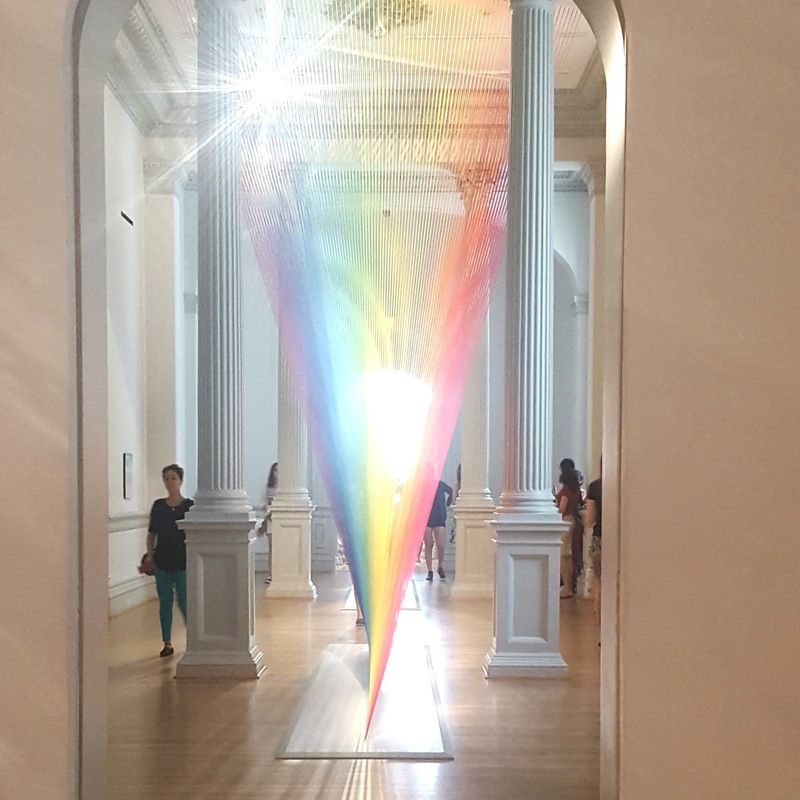 Saturday, we went to brunch at Old Ebbitt, had some fun at the Renwick Gallery, spent the day shopping in Georgetown, paid a visit to Mr. Lincoln, and went home and devoured 2 pints of ice cream. Sammi left on Sunday morning with a promise to come back soon! I love that she fell in love with DC and can't wait for her to come back! This past week was the calm before the storm of 6 deadlines at work this week but I celebrated Negroni Week with my friend Alicia, went on a lot of long walks, and spent 2 glorious days working from my backyard with Peyton at my feet soaking up the sun. The Pilot left on Thursday for a 4-day trip with a DC overnight on Friday which meant that he would be home. Best part? My big sister, Zuzy called me on Thursday to say she was flying in for a short weekend for work and asked if I had plans Friday night. The Pilot landed at 2 and I finished up work and we biked downtown to pick up my sis. 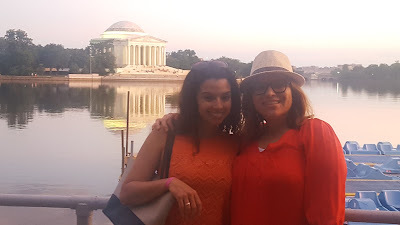 We made a stop for appetizers and drinks at Oyamel, walked all the way down to the Jefferson Memorial along the most beautiful DC sunset I've ever seen, and had a night cap at Old Ebbitt before taking her back to her hotel and biking back home. Sunday morning we were up bright and early to take Peyton to her dog sitter. The Pilot had to resume his trip with a flight to Charlotte which I decided to tag along for! He had a Des Moines overnight on Saturday and when he got his schedule, I reached out to some friends in Des Moines to see if they were in town. We landed in Charlotte, had a 2-hour layover (I could've taken a later flight but I really wanted to be on his flight!) and then he took off to Raleigh and I headed to Des Moines! My friend Laura picked me up from the airport and took me to her house where I helped her get ready for her little one's 1st birthday! I spent the afternoon with them and The Pilot got there around 9. We stayed out catching up with our friends until around midnight and then headed back to our hotel for some shuteye. Sunday morning, we met our friends for breakfast and then went to a local coffee shop to meet up with a DC friend of ours who's interning in Des Moines for the summer! Our flights were supposed to take off around 4 and they were delayed by a few hours so The Pilot and I headed out for a 3.5 mile run around the airport. It was about 100 degrees but I actually felt pretty good! It wasn't the long run I was supposed to get in but at least I still got some miles in...especially since I didn't think I'd get any! Our flights kept getting delayed and delayed and delayed. One point, I realized that my connecting flight wasn't going to get me to DC on time so I changed course and made my way to Chicago. The Pilot was headed there too but I jumped on a different flight in hopes of catching a 10pm flight to DC. After realizing that my chances of getting on that flight were slim, I made way over to the Pilot's last flight of the weekend and headed to Dayton, OH where we spent the night. 3 very short hours and 45 even shorter minutes after checking into the hotel, we were up bright and early to make our way home to DC. I'm going to be a zombie the week but it was so worth it! I hadn't been to Des Moines since my friends got married and it was great to meet their little ones and meet up with our friend from DC. 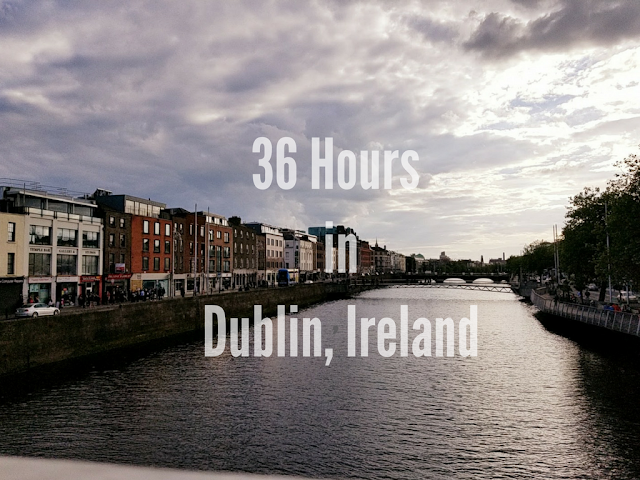 I definitely got a glimpse of the Pilot's life this week with 5 flights in 48 hours and a 25 hour overnight but it was well worth it to spend time with friends and not have to talk to my husband on the phone for once! Plus, going on another overnight with him was on my 30 Before 30 list! I hadn't done this since before we moved to DC! So that's what's been going on with me lately. What's going on in your world? What's the most whirlwind weekend you've ever had? Do you have a record number of flights taken in a minimal amount of time? 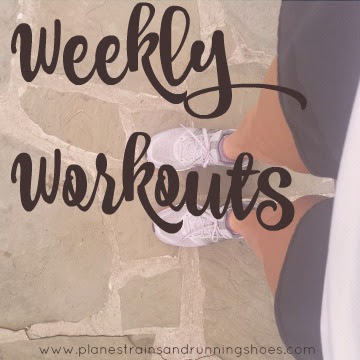 Last week was a step back week. I didn't really feel like I needed it but by the end of the week, I realized that I definitely did. I'm feeling better about this training cycle each week and feel like Sea Wheeze is coming up quickly. This is the first half I've trained for in 3 years and it feels like I'm so far behind where I should be, because from the marathon standpoint, I am. I should have trained for a strong half this past fall instead of jumping into marathon training, but when I entered the Chicago lottery in March, I thought I'd be able to start running right away. One thing I'm noticing about this training cycle is that I'm finally starting to feel like I'm training again. I'm running on days when I just don't feel like it and am actually having good runs on those days. I'm relishing rest days as just as important as training days, and I'm actually cross training. Now, if I can actually mix strength training into this, I'll be in great shape! Monday: 2-mile time trial with 1 mile warm up. This was tough. 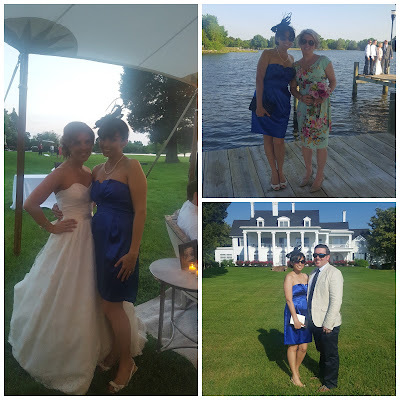 My legs were tired from the dancing all night at Ally's wedding and then running 6 miles the next morning. It was incredibly hot..the kind of heat that can only be broken my a thunderstorm...but I still managed to run under a 9-minute pace for the 2 miles. Thursday: 40 minutes of at-home yoga and a roughly 3-mile walk to and from a work event. It was a gorgeous night and my training plan called for yoga or a long walk, so I did both! Friday: Rest. If you can call it that. 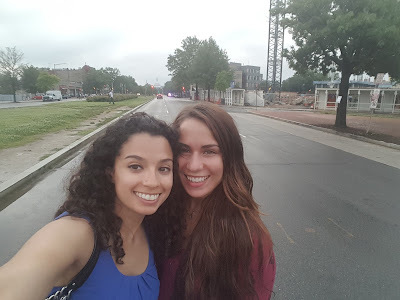 My sister was in town and we walked 12 miles all over DC. When I got home that night, I felt like I had just run 12 miles. Saturday: 4 quick miles before spending the day wandering around DC with my sister...this time for only 6 miles. Sunday: 2 easy miles and 30 minutes of at-home yoga followed by a massage, where my therapist was astounded at how tight my calves are. I'm already feeling good about this week. I did not want to run last night, but had a great 3.5 mile run anyway. Tonight, I'm meeting up with Tracy for some outdoor yoga! 4 weeks down, 10 to go!